White a aims at a counter-pincer strategy: 3-4 point high approach, two-space high pincer, one-point jump. White b tends to create more complications: 3-4 point high approach, two-space high pincer, ogeima; including Kajiwara's variation. 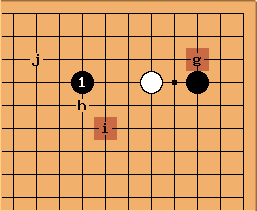 White c is mentioned in Ishida as being not joseki anymore. However, it has recently come into fashion again. Bloody-thirsty fighting can arise from it; even the non-joseki variations are worth studying: 3-4 point high approach, two-space high pincer, keima. The outside attachment at d depends on a ladder: 3-4 point high approach, two-space high pincer, outside attachment. It can lead to the infamous Magic Sword. The two-space jump at e is a light move, intended mostly to avoid problems: 3-4 point high approach, two-space high pincer, two-point jump. The extra-large knight's move at f has been played for two decades, but only recently are some joseki emerging: 3-4 point high approach, two-space high pincer daidaigeima. The bump at g is a rare play. Tenuki: 3-4 point high approach, two-space high pincer, tenuki. Some other variations. The inside attachment at g is not considered good with this pincer (see 3-4 point high approach, two-space high pincer, inside attachment). White h was tried in a title game (Judan match game 1, 1971-01-06) Otake Hideo-Hashimoto Utaro. White i is an emergency measure and a rare move; White j is not so rare. This is quite an old pincer (from the 1930s) but relatively unexplored until about 1970. An early reference is the Go Super Series book by Hasegawa Akira. The book Essential Joseki is perhaps a better introduction than Ishida, but gets the history of the main line play b a little wrong. 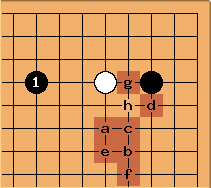 It was introduced 1952-03-11 by Fujisawa Kuranosuke, as he then was, in a jubango game against Go Seigen. Go Seigen was a great innovator, but in this case his opponent deserves the credit. The Chinese Opening by Kato Masao spends 27 pages on this pincer in Chapter 5. A problem with studying this joseki is that some of the books emphasise old lines from the 1950s, or trick plays.